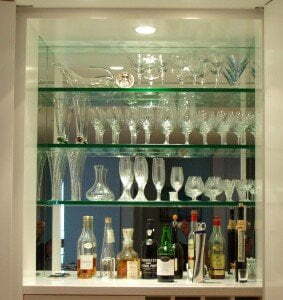 GlassWorks’ custom Bar Mirrors are a great addition to your home bar. Whether complemented by our glass shelves or standing alone, our custom Glass Mirrors provide the perfect mirror solution for your bar. Our design experts will work with you from start to finish to create the perfect look for your home, and our expert production staff will have it done in no time. Our trustworthy, expert installers will treat your home as if it were their own and ensure that your Bar Mirrors are installed correctly to last for years.